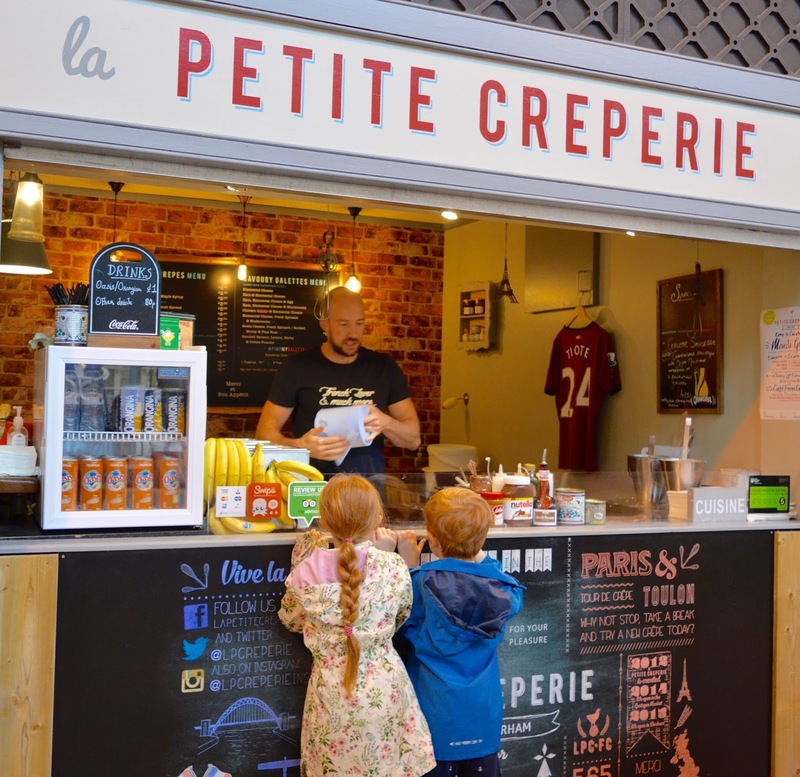 Newcastle's Grainger Market probably isn't the first place you'd think of when planning a family day out in Newcastle but it's honestly one of our favourite spots in town. It's FREE to visit and soak up the atmosphere, the stalls and traders are all local people and your visit will support them and with over 100 traders, there is always something new to discover. The Grainger Market is so much more than 'just a market' - it's a bit of a Newcastle institution I think. 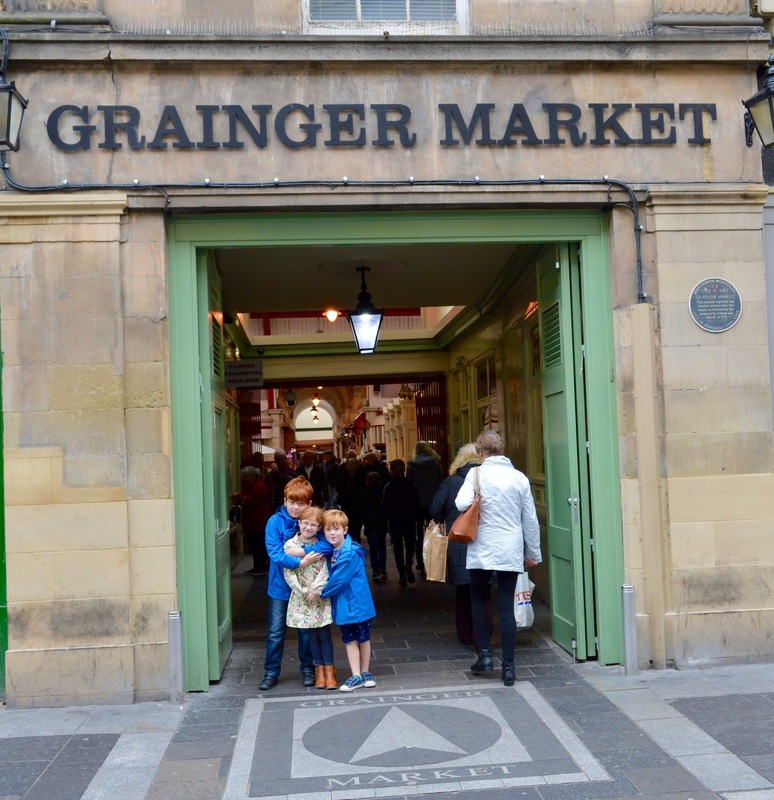 We probably visit the Grainger Market more than any other shop in Newcastle and really enjoy taking the kids along for the experience too. We visited last weekend and took some snaps from our visit and I can't wait to share a few highlights from our last visit. Above all, I really hope I inspire you to visit with your own children and for you to experience all there is to offer yourself. 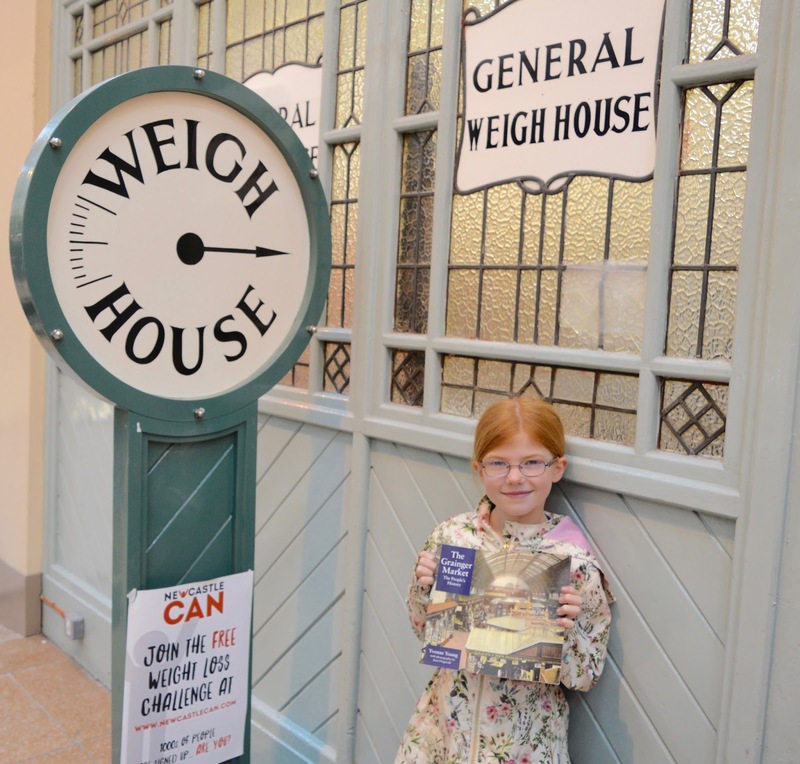 It's free to visit The Weigh House and 50p if you'd like to weigh yourself. The scales in here are HUGE. The Weigh House is an original feature from The Grainger Market and it is one of the few units which has an entrance in more than one alley. Traders used to use the scales to weigh their deliveries and it's very easy to picture them doing this when you step inside. Ellen's Cosmetics is like an Aladdin's Cave and the staff here are so lovely and happy to provide lots of advice. 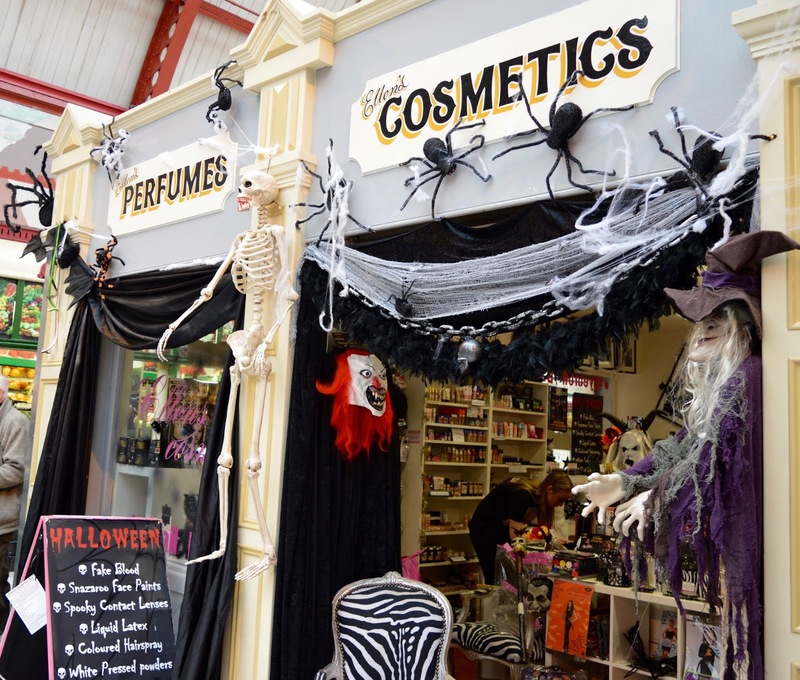 The store changes with the seasons and in October has been tranformed into a one-stop shop for all things Halloween. 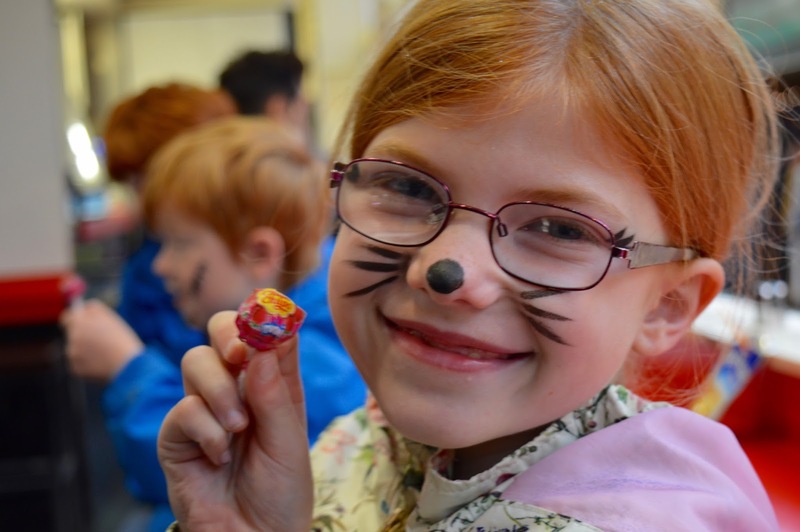 From face paints to glitter hair spray, temporary tattoos and make-up, it's a fab shop for kids to spend their pocket money. 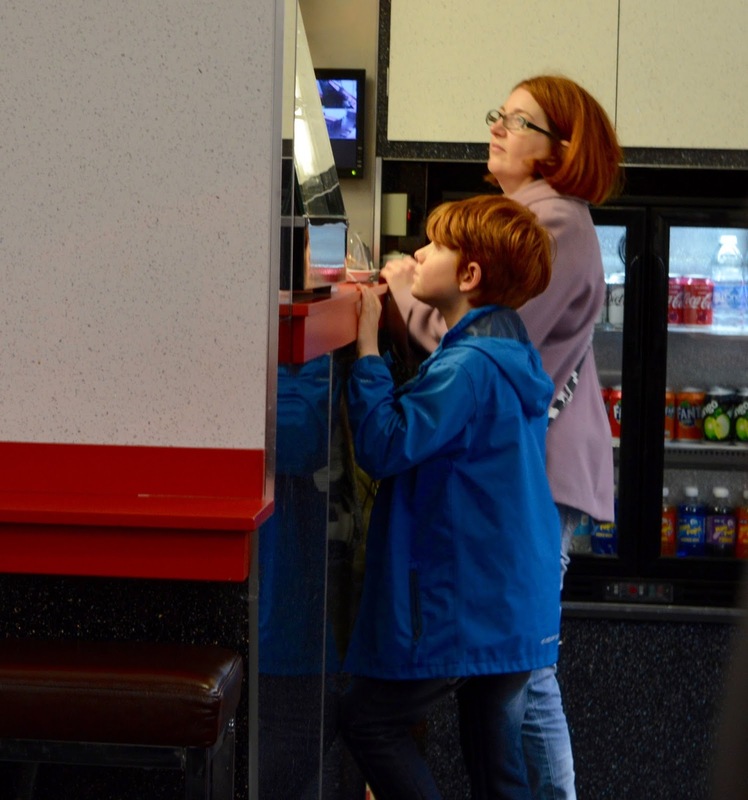 I have lots of memories of visiting the old-school cafes in the Grainger Market for a cheap lunch with my own parents and love doing this with my own kids too. 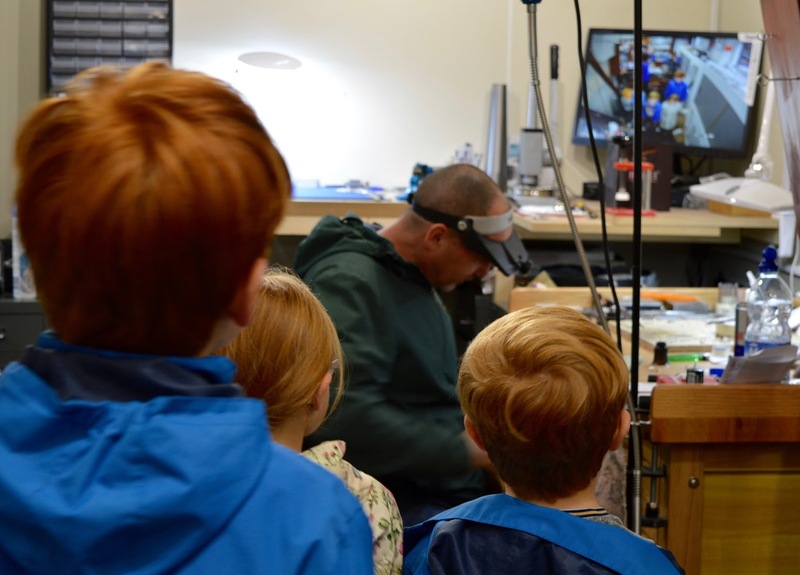 This time we visited Wi-Fri and Harry bought himself a hot dog and the kids enjoyed a cup of juice whilst Steve crossed over the alley to Pumphrey's Coffee to get his espresso hit. The prices here are rock bottom and the staff are lush - they came around and offered the kids a lollipop each as we left. After our morning in the Grainger Market the kids were being dropped off at grannies as we had tickets to see Katherine Ryan and plans to stay at Hotel Indigo. 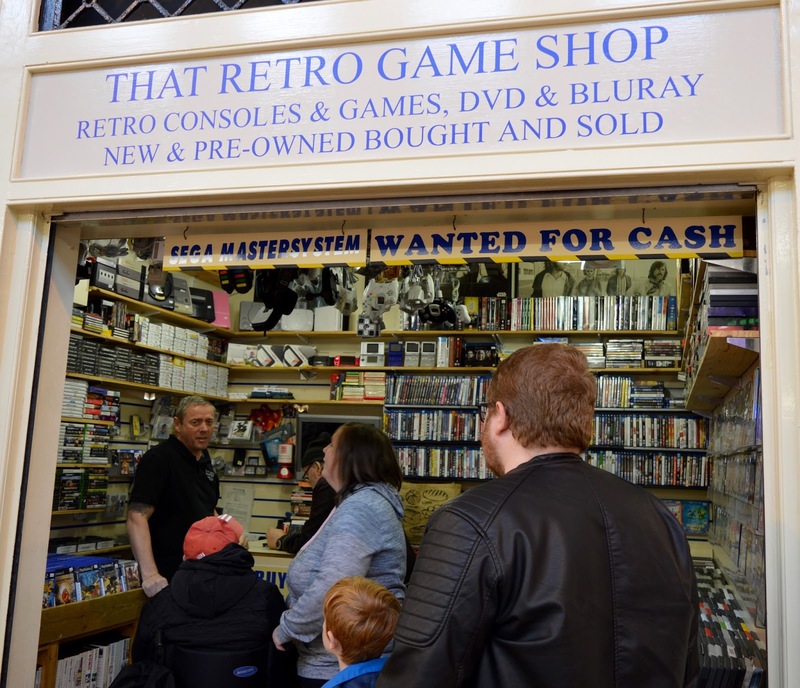 We popped into That Retro Game Shop and Jack picked up a Disney DVD for £5 to take with him. I love the retro game consolde that are suspended from the ceiling here and I pointed out an original Playstation to the kids. 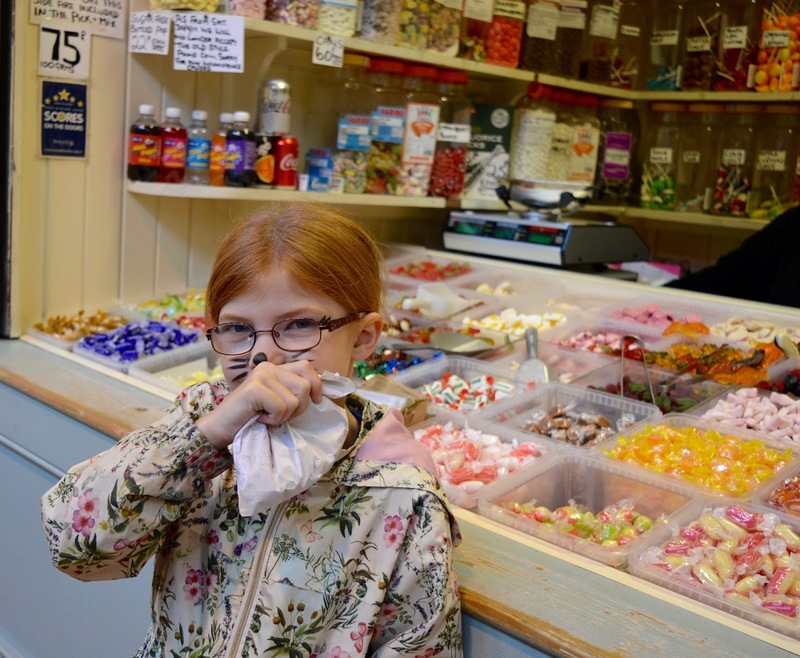 There's a proper sweet shop in the heart of The Grainger Market and Heidi loved choosing her own pick and mix for later. There's lots of choice and they had my favourite giant strawberries. Yum! 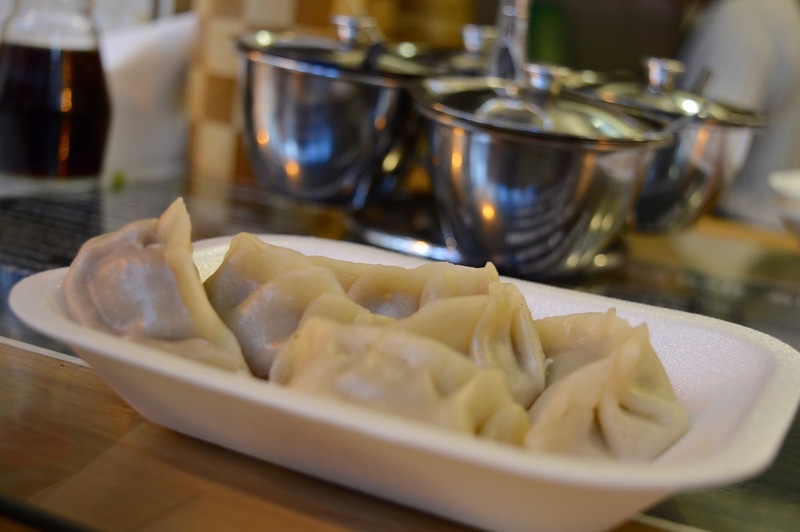 Finally, our morning ended with a trip to Nan Bei Dumpling Bar. The kids loved watching these being made and were captivated by the Golden Lucky Cat on the counter welcoming in good luck. The dumplings here are so tasty and perfectly sized for little hands. At just £3.50 for 6, they're a bargain too. Other places we love at The Grainger Market include La Casa which sells the best Spanish food. There are often tasters available too. The Frech Oven is fab for a takeaway lunch and we love their soda bread. Pet Lamb Patisserie is one of our favourite places to pop in for a treat - Jack LOVES their brownies and their cupcakes are delish! We also adore Matthew's Cheese Shop and will be re-purchasing a Christmas cheese board (check out last year's cheeseboard here). The Simply Small Company is a beautiful children's boutique and if you're lucky, owner Natalie might let your children choose something from her sweetie jar as you browse the gorgeous clothing, gifts and furniture on offer and finally, Pizza by Slice is a real Grainger Market institution and the constant queues speak for themselves. The Grainger Market features over 100 local traders and is open Monday - Saturday 9am-5:30pm. If you're looking for a purse-friendly morning out, delicious food and to experience a bit of Geordie history, pop-in next time you're in Newcastle and let me know what you get up to. I have teamed up with the Grainger Market to giveaway a fabulous bumper prize worth over £200 to one lucky reader. To enter, simply head over to this Facebook post and follow the instructions. I LOVE the Grainger Market and really don't go enough! Last time I popped in I couldn't believe how many new little restaurants have popped up in there, i have such a list of places to try now! I wish I could be as excited about the market as you are today, it's my first day back after holiday. Haha! In all honesty, I'm quite looking forward to going back. I've missed the friendly faces and, quite frankly, the pizza! Love this post, so sad we missed you.